Esha Bansal performs for Lawrence General patient John Michaud. In a room on the telemetry unit at Lawrence General Hospital, there came a quiet knock at the door. 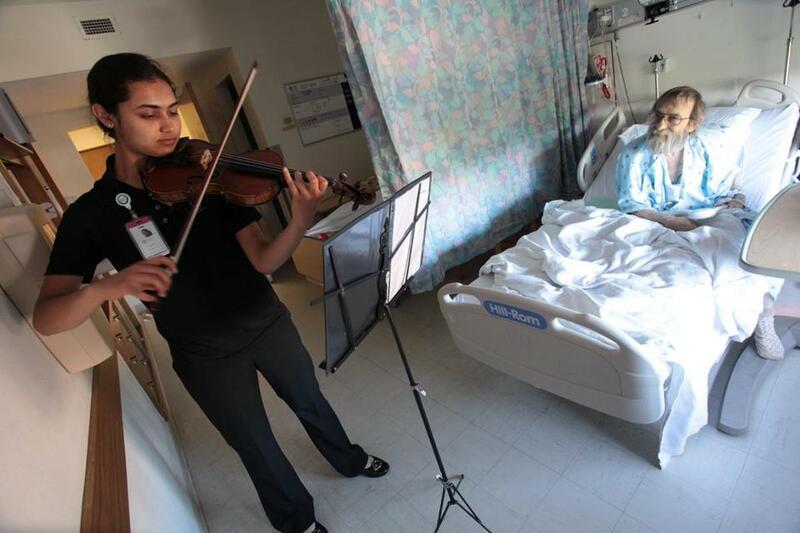 A petite 17-year-old entered with a violin, and was heartily welcomed by two patients watching television. “The band is here!” one quipped as Esha Bansal raised her bow and proceeded to play a lively Irish jig. The two men smiled, clapped, and tapped their feet clad in hospital tread socks. A hospital may be the last place you would expect to hear live music, but, according to MusicMDs, it should be one of the first. “It brings a new dimension to patient interaction — removing traditional barriers of language, education level, culture, race, and socioeconomic status,” said Bansal, a junior at Phillips Academy in Andover. She and her brother started the nonprofit, all-volunteer musical outreach program in Florida — where their family lives — in 2009. Music has long been considered a holistic form of healing; it’s believed to promote well-being and happiness, reduce stress, boost immunity, alleviate pain, enhance memory, promote physical rehabilitation, and reduce depression, fatigue, and blood pressure, among other benefits, according to the nonprofit American Music Therapy Association. Bansal and her older brother, Varun, both musicians from a young age, became intrigued by the idea after seeing how their violin playing affected their grandmother as she was fighting cancer. “We noticed changes in her mood and her outlook,” recalled Bansal, who started playing violin and piano at age 7. That inspired the siblings — just 13 and 15 at the time — to form MusicMDs, starting with a pilot program at Holmes Regional Medical Center in their hometown of Melbourne, Fla. Since then, the program has broadened to three hospitals in Florida, as well as one in Houston, with music provided by high school and college students. Bansal started up the Lawrence General Hospital chapter, which now has seven members (all Phillips Academy students), in December 2012. Lawrence General volunteer coordinator Brenda LeBlanc said Bansal approached her about the program just as the hospital started exploring ways to incorporate music. In the 17 months since then, students have given 35 performances in eight areas of the hospital, according to Bansal. And, as she and her fellow performers noted, the reactions and feedback have been overwhelming. On a hospital testimonial page, patients, staff, and family members have expressed gratitude and encouragement, called them angels and treasures, and said their music has been like a cure, offering them a new lease on life, turning their days around. Many have even been moved to tears. Plus, it provides an unusual space for the young musicians to sharpen skills and learn about life. The hope is to expand the program; because it’s free and volunteer-based (and there are no shortages of musicians in any given city), it can easily be replicated, Bansal said. On a recent Saturday afternoon, with violin case and collapsible music stand in hand, Bansal headed up to Lawrence General’s fifth-floor telemetry unit, which is for patients requiring heart monitoring. Polite, polished, and dressed in black, she stopped at the nurse’s station, then set up her stand and removed her violin from its case. She started with Violin Concerto in G major by Joseph Haydn, playing for Lebanon native Nazek Chatila, seated outside her room with a walker. “Nice, very nice!” Chatila exclaimed when Bansal finished. “You were very good!” Michaud, with long white hair and matching beard, dressed in a hospital johnny, said when she was done. Eager to talk, he told her he started drumming at age 7, and was in a band as a teenager. “I was the youngest drummer in Lawrence,” he said proudly. That sort of interaction beyond the music is an integral part of the program, LeBlanc explained. Meanwhile, down in the lobby, 15-year-old pianist Tim Ossowski was set up next to floor-to-ceiling windows as the Saturday afternoon light streamed in. As he played some Chopin etudes on a Yamaha electronic piano, patients, nurses, and visitors coming in and out stopped, if only for a moment or two, to listen; others sat for a bit to watch him play. As he finished each piece, he was met with a small round of applause. For details on the program, visit www.musicmds.org.